It may not be the ideal time of year for sub-par rounds of golf but Damian Mooney and Gareth Graham belied that notion to post rounds of three-under-par 66 and share top spot at the Ping PGA Ulster Golfers’ Alliance event at St Patrick’s, Downpatrick. Mooney (Damian Mooney Golf) had built a three-shot advantage by the eighth hole having birdied the second, third and eighth. He drove the green for a birdie three at the second, found the green at the long third with a drive and six iron, while at the short eighth he wedged to one inch. However, the charge was halted when he drove into trees leading to a bogey five at the ninth to turn in two-under-par 33. Damian’s drive for success was recharged with a 25-foot birdie putt at the short 11th, after an eight iron approach to the green, but another wayward drive into trees at the 13th cost him another stroke. That was offset when he chipped to a foot for a birdie three at 16 and with a par/par finish, he was back in 33 for his 66. Graham (Groomsport DR) birdied the long third after a drive and four iron to 20 feet and picked up another shot at the the par-four sixth but wiped out the advantages when he visited the trees, followed by the sand and then three-putted the seventh for a double-bogey six. A chip and putt birdie three at the 10th, followed by a four-foot birdie on 13 and a six-footer at the next got Graham to three under but after duffing a wedge and taking three to get down he pencilled in bogey five at 17. Still, the Groomsport pro finished strongly with an eight iron to 10 feet for a birdie two at the last as he tied with Mooney. Professionals: 66 (-3) – D Mooney (Damian Mooney Golf), G Graham (Groomsport DR). 69 – P Farrell (Laganview Golf Centre). 70 – C Carvill (Belvoir Pk), R Whitford (Knock). 71 – G Wardlow (Spa), C Lyle (Donaghadee). Overall Nett, 43 pts – S Goldthorpe 16 (Blackwood). Category (14+), 42 pts – S McKillop 16 (Portstewart); 39 – L Hale 21 (Shandon Pk). Gross, 35 pts – I Smyth 4 (Clandeboye). Team: 93 pts – Pro D Mooney (Damian Mooney Golf) with N Gallagher 10 (Hilton Templepatrick, R Clarke 15 (Dunmurry) & A Hynds 8 (Dunmurry). A composed two under par 69 gave Brian McElhinney victory in the Ping PGA Ulster Golfers’ Alliance event at Ballycastle GC. The North West GC professional finished one shot ahead of home-club pro, Damien McEvoy, who was left to rue a double-bogey at the par four 16th. In third place was Shaun Donnelly (Castle Hume) on level par 71, as the former Ballycastle hurler returned to pastures old, where he played his amateur golf. Winning the amateur’s nett prize, on 42 points, was Shandon Park five-handicapper Ward Farrell, who outshot his dad Philip, the Laganview Golf Centre pro. Philip carded a one-over 71 for joint fourth position. The gross amateur winner was local scratch player Michael Dallat who posted 37 points. McEvoy missed out on individual honours, but he managed to guide amateur partners Ciaren Moat (7), Alan McCook (10) and Hugh Sayers (6) to the team prize with 90 points. The next UGA Ping event is at Royal Belfast on December 6. Professionals: 69 (-2) – B McElhinney (North West). 70 – D McEvoy (Ballycastle). 71 – S Donnelly (Castle Hume). 72 – C Carvill (Belvoir Pk), G Wardlow (Spa), P Farrell (Laganview). 73 – C Lyttle (Ballyclare). Amateurs: Nett, 42 pts – W Farrell 5 (Shandon Pk). 39 – G Robinson 12 (Carrickfergus). Gross – 37 pts – M Dallat scr (Ballycastle). Team – 90 pts – Pro D McEvoy with Amateurs C Moat 7, A McCook 10 & H Sayers 6 (all Ballycastle). NOW that Rory McIlroy’s season has come to an end, coach Michael Bannon has time to show his own skills in competition. On Tuesday (Nov 22), he made a rare appearance on the PGA Northern Branch tour at his former amateur base, Ardglass. However, the ex-Bangor club pro had to settle for second place behind Damian Mooney who mixed birdies with bogeys in the Ping Ulster Golfers’ Grand Prix to post a one-under-par 69, two strokes ahead of second-placed Bannon. The winner stormed to three-under-par after seven holes with birdie threes at the second, fourth and seventh. His short game came into play as he rolled in a 20-footer, after a nine iron to the green at the second, drove the green at the fourth and got down from 15 feet on the seventh. The run ended when he missed the eighth green and dropped a shot. On the back nine, Mooney (Nevada Bobs Belfast) had only two pars as he pencilled in three birdies and four bogeys. He made light work of the par five 11th for birdie, reached the green with a three iron for a birdie three at the 13th and then got up and down from a bunker at the par five 15th to record his sixth birdie of the day. His dropped shots at the 10th, when he three-putted and he missed the green at the short 12 and par four holes 14 and 16, failing to get up and down each time. In the amateurs’ gross section, Joe Crangle (Fortwilliam) and local Ray Madine shared 31 points with the Fortwilliam one-handicapper taking first place on countback. Kirkistown’s Gary Smyth won the top nett award on 38 points, playing off eight, while Damian Mooney made it double delight by partnering Lurgan six-handicapper Colin McKee to victory in the team butterball event with 41 points. Next Tuesday, there will be a Ping Ulster Golfers’ Alliance outing at Ballycastle. Professionals: 69 (-1) – D Mooney (Nevada Bobs Belfast). 71 – M Bannon (Bangor). 74 – M Weir (Spa), G Graham (Groomsport Golf Centre), A Cathers (Ardglass). 31 – R Madine 4 (Ardglass) … 2nd. Nett, 38 pts – G Smyth 8 (Kirkistown Castle). 37 – A Verner 7 (Clandeboye). Team Betterball: 41 pts – Pro D Mooney (Nevada Bobs Belfast) & Amateur Colin McKee 6 (Lurgan). Five birdies and just one bogey took Colin Lyttle to the top of the professionals’ leaderboard at Wednesday’s Ping PGA Ulster Golfers’ Alliance tournament. The Ballyclare GC pro put together a fine round of four under 67 at Donaghadee to secure a two-shot victory over Simon Thornton. Starting his round at the 10th, Colin reached the turn in three under par 32, courtesy of birdies at the 12th, 14th and 18th when he wedged his approach to just eight inches. He parred the first, his 10th of the day, and then birdied the par five second to reach four under for his round. His final birdie came at the sixth when he rolled in a birdie putt from 10 feet but he then three-putted the seventh for his only mistake of the day before closing out his round with a par at the ninth. Clandeboye seven handicapper Chris Turney topped the amateurs’ nett leaderboard with 41 points while plus-one Mourne handicapper Stephen Barker won the gross prize on one-under-par 70. Local pro Craig Lyall led home the winning team of Gareth Boyd (1), John Ross (5) and James Templeton (11), all Donaghadee members, on 89 points. Next Monday, the action moves to Knock for another Ulster Golfers’ Alliance Ping-backed tournament. 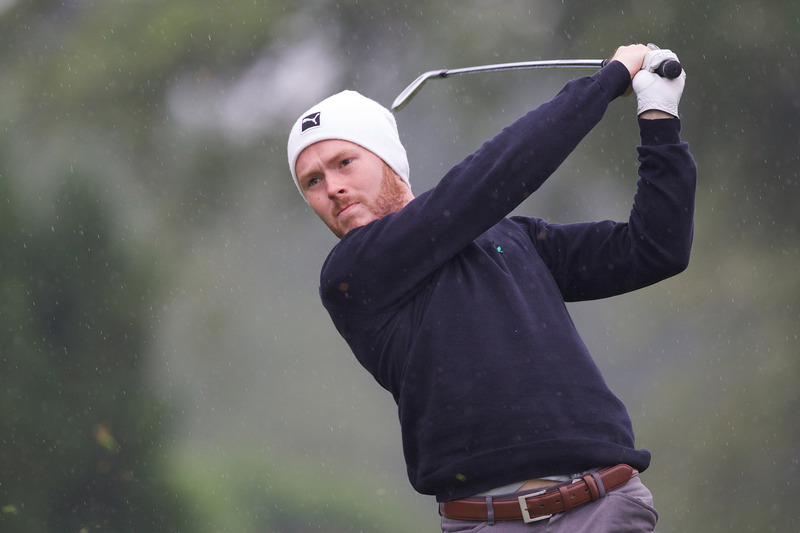 Professionals: 67 (-4) – C Lyttle (Ballyclare). 69 – S Thornton (Unattached). 70 – C Lyall (Donaghadee). 71 – G Graham (Groomsport DR); D Mooney (Nevada Bobs Belfast). 72 – G Wardlow (Spa), C Carvill (Belvoir Pk), S Hamill (Lisburn). Amateurs: Nett, 41 pts – C Turney 7 (Clandeboye). 40 – C Tiffen 6 (Lambeg). 39 – S Boyd 10 (Roe Pk). 38 – B Rossi 7 (Belvoir Pk) … 4th. 38 – D Girven 17 (Aughnacloy). Nett: 89 pts – Pro C Lyall with Amateurs G Boyd 1, J Ross 5 & J Templeton 11 (all Donaghadee). You can’t keep Simon Thornton out of the prizes in PING Ulster Golfers’ Alliance events these days. The Royal County Down man was back in form at Castlerock this week but he had to share top billing with Laganview’s Phil Farrell. This event had been scheduled for Ballycastle GC but with bad weather making the Co Antrim venue unplayable, a new home was found at Castlerock with 15 holes used on the day. In crisp conditions, Thornton produced a bogey free round which included three front nine birdies on his way to 33 stableford points. His ‘three-pointers’ came at the two par fives, the third and the fifth. His third and final birdie of the day came at the par four sixth when he rolled in a 15-foot putt. Farrell also found the front nine more scorable. He birdied the par four first after firing a wedge shot into three feet and added further birdies at the third and fifth. He collected his fourth birdie of the day at the par four 13th courtesy of another pin-seeking approach shot but a sloppy three-putt bogey at the par five 16th set him back and he had to settle for a share of first place with Simon. Kilkeel’s Sean Ross, a one handicapper, won the amateur gross prize with 27 points. The amateur nett award went to Hilton Templepatrick’s Niall Gallagher. The team prize was collected by Massereene pro David Hughes and partners Nathan Kernaghan, Stephen Foster and Sean McComb. A late birdie blitz gave Noel Murray victory in the opening round of the PING Summer Masters event at Lurgan Golf Club. The Massereene man grabbed three birdies in his final four holes to post a two-under-par 68 and win by two strokes from Loughgall’s Vivian Teague with Gary Wardlow (American Golf) and Ricky Whitford (Knock) a further shot back in joint third position. Murray made a bright start, rolling in a six foot putt at the third for an early birdie but he immediately gave the shot back at the next when he three-putted for bogey and he then failed to get up-and-down for par at both the sixth and eighth. That left Noel out in two-over-par 37 but he halted the slide with a birdie three at the 10th , hitting a drive and wedge to eight feet and rolling home the putt. At the 15th his chip for eagle finished on the lip and he tapped in for a birdie four, at the par three 17th he rifled a seven iron to 12 feet and slotted home that putt before finishing with a chip and putt for birdie at the long 18th. That finishing flourish gave Murray a home run of four-under-par 31 and a round of two-under 68. Evan Simpson, a Loughgall 11-handicapper, won the amateurs’ top nett prize on 44 points while South of Ireland Championship winner, Stuart Bleakley (Shandon Park) topped the gross list on regulation 70. The Loughgall quad of pro Vivian Teague and amateurs Evan Simpson (11), Jim Curran (21) and Noel Heggarty (14) topped the team leaderboard with 94 points. Professionals: 68 (-2) – N Murray (Massereene). 70 – V Teague (Loughgall). 71 – G Wardlow (American Golf), R Whitford (Knock). 72 – P Farrell (Laganview Golf Centre). Amateurs: Nett, 44 pts – E Simpson 11 (Shandon Pk). 42 – M Wood 17 (Shandon Pk). 37 – S Goldthorpe 12 (Carnalea) … 19 back; M McCrory 6 (Clandeboye) … 18 back. Gross, 70 – S Bleakley 1 (Shandon Pk). Team: 94 pts – Pro V Teague plus amateurs E Simpson 11, J Curran 21 & N Heggarty 14 (all Loughgall). The Ulster Golfers’ Alliance wrapped up their season at Portstewart with Noel Murray making light of wet and windy conditions to win the final outing in The Ping Race to the Strand. Murray carded a blemish-free five-under-par 67 to be three strokes clear of tour player Simon Thornton (Team Ireland), with Damian Mooney (Ballyliffin) and Barrie Trainor (Cairndhu) sharing third place a further shot back in joint third position. Murray was in sparkling form as he raced to the turn with a hat-trick of birdie threes for an outward run of three-under-33. At the second he holed from 10 feet and then, after five straight pars, made back-to-back birdies at eight and nine. He maintained his charge around the turn and added another birdie at the par five 13th courtesy of a two-putt and then finished his round in style at 18, pitching to 12 feet and rolling in the putt for his fifth birdie of the day. There was a tie at the top of the amateurs’ nett leader board as Scrabo’s David Graham (6) and Balmoral’s Niall McCallin (9) both posted 38 points. Graham took first place with 19 points coming home to McCallin’s 17. The gross winner was Galgorm Castle member Michael Alexander (5) who carded 31 points. The winning team was led in by local pro Neil Graham who had Portstewart amateurs Marty Hughes (5), Stephen Henry (10) and Joe Lyons (18) as his partners. The home team won on 87 points. With the winter action now completed the players will move on to the Ping Summer Masters Series with the first tournament in that scheduled for Lurgan on April 23. Professionals: 67 (-5) – N Murray (Massereene). 70 – S Thornton (Team Ireland). 71 – D Mooney (Ballyliffin), B Trainor (Cairndhu). 72 – R Whitford (Knock). 73 – G Wardlow (American Golf). Amateurs: Nett, 38 pts – D Graham, senior 6 (Scrabo) … 19 back. 38 – N McCallin 9 (Balmoral) … 17 back. 37 – R Hanna, junior 6 (Lurgan). Gross, 31 pts – M Alexander 5 (Galgorm Castle). Team: 87 pts – Pro N Graham with amateurs M Hughes 11, S Henry 10 & J Lyons 18 (all Portstewart). A CHANGE of putter appears to have paid off handsomely for Chris Selfridge (Moyola Park) after he booked his place in the final of the Cathedral Eye Clinic North of Ireland Championship at Royal Portrush on Friday. Frustrated by his inability to convert chances, the University of Toledo student spent recent weeks searching for the right short stick before finally settling on a Ping model which seems to have made all the difference. “Since I came home five weeks ago I have had four different putters trying to figure it out,” added the 21-year-old from Castledawson. “Words can’t describe how bad it was. I finished 14 shots behind in the English Amateur and I missed 17 putts inside four feet over the four rounds. Selfridge was in fine form yon Friday beating leading qualifier Brian Casey (Headfort) in the morning and then Irish Close Champion, Cormac Sharvin (Ardglass) in the semi-final. He was never behind at any stage, closing out both ties 3&2. “I was very solid and gave myself a lot of birdie chance,” said the 21-year-old. His beaten opponent, Sharvin, admitted that his own game was, ‘not where he wanted it to be’ and tipped Selfridge to win the title today. “I can’t see Chris losing. Every time I made a mistake he cashed in,” said Cormac. Selfridge will face Gary Hurley (West Waterford/NUIM) in today’s final. The 20-year-old produced some of the best golf of the day in seeing off Michael Reid (Galgorm Castle) 6&5 in the quarter-final and then Geoff Lenehan (Portmarnock) 6&5 in the last four. “The whole day was the same really in terms of how I played; I just kept it in play,” said Munster representative Hurley. “I played well against Geoff after getting off to a quick start. We get on well and we played a few games together last year in the inter-provincials for Munster. C Selfridge (Moyola Pk) bt B Casey (Headfort) 3&2; C Sharvin (Ardglass) bt H Diamond (Belvoir Pk) 1 hole; G Lenehan (Portmarnock) bt S Grehan (Tullamore) 3&2; G Hurley (West Waterford/NUIM) bt M Reid (Galgorm Castle) 6&5. Selfridge bt Sharvin 3&2; Hurley bt Lenehan 5&4. Massereene GC assistant, Noel Murray, who was runner-up in the Irish Region PGA Championship at Mount Juliet, carried his good form into the Northern Branch Ping Ulster Golfers’ Alliance tournament at Lurgan. Murray set the early target at three-under-par 67 but by the end of the day he had to share top spot with Wes Ramsey and Peter McCarroll. The pace-setter began at the 10th tee and carded a blistering back nine of five-under-par 30. His approach play and putting were spot on and, after chipping to six inches for birdie three at 10, he reeled off four birdies in a row from the 12th hole. A pitching wedge to two feet and 12 feet gave him birdies at the short 12th and par four 13th. He rolled in a 10-footer for birdie, after a gap wedge to the green, at 14 and chipped to six feet at the next. The Massereene man’s only stumble on the back nine was a three-putt at the short 17th for bogey but he regained the lost ground with a chip and putt for a four at the long 18th. Murray missed the third and sixth greens for a pair of bogey fives on the front nine. Ramsey, who began from the first, missed the third green for bogey but turned in one-under-34 after picking up a shot at the fourth and then holing from 15 feet for three at the fifth. On the way home, he made birdie threes at 13 and 16, getting down from three and eight feet. Brian McClure, a nine-handicapper from Spa, and Andy Wilson, who plays off eight out of Lurgan, shared 40 nett amateur points with McClure edging home with 20pts on the back nine to Wilson’s 19. The gross prize was won by plus-four international Dermot McElroy (Ballymena) who posted 69, while the team event prize went to the Co Armagh quartet. PING ULSTER GOLFERS’ ALLIANCE AT LURGAN. Professionals: 67 (-3) – N Murray (Massereene), W Ramsey (Knockbracken), P McCarroll (Allen Pk). 69 – D McWilliams (Unattached), P Martin (Collin Pk). 70 – JU Scullion (Kilkeel). 71 – G Wardlow (Dunmurry), D Mooney (Ballyliffin). Amateurs: Nett, 40 pts – Brian McClure 9 (Spa) .. 20 back; Andy Wilson 8 (Lurgan) .. 19 back. 39 – Janet Forbes 13 (Loughgall). 38 – Phil Posnett 4 (Downpatrick). Gross, 69 – Dermot McElroy +4 (Ballymena). Team: 89 pts – Tony Murtagh with Paddy Duffy 10, Johnny Palmer 15 & Natty McGeown 9 (all Co Armagh).